The Awareness campaign on Energy Drinks and Diet Pills was held on April 2, 2016 in Byblos Souks. 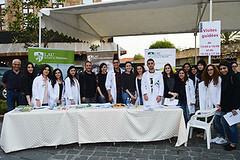 The activity was organized by nursing faculty Dr. Rita Doumit and involved faculty and students from the School of Nursing, Nutrition Program, and School of Pharmacy. The Osteoporosis Awareness Campaign was held on March 19, 2016 at ABC Mall, Dbayeh. The activity was organized by Nutrition Program faculty Ms. Sandra Karnaby and involved faculty and students from the School of Nursing, Nutrition Program, and School of Pharmacy. The Clinical Cases Preparation and Presentations were a series of two practice IPE activities that were held on January 29, 2016 at LAUMC-RH. 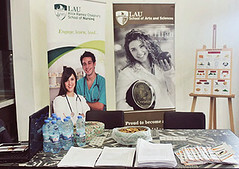 The activities were organized by nursing faculty Dr. Rita Doumit and School of Pharmacy faculty Dr. Soumana Nasser at LAUMC-RH and involved faculty and students from the School of Nursing, Nutrition Program, and School of Pharmacy. The Clinical Simulated Experiences were a series of six practice IPE activities that were conducted at the clinical simulation center within the Chagoury Health Sciences Center on March 16, March 23, March 30, and April 4, 2016. The activities were organized by School of Medicine faculty Dr. Vanda Abi Raad and nursing faculty Ms. Maha Habre. They involved faculty students from the School of Nursing, School of Medicine, and School of Pharmacy.